TIP: Turn Your Phone On Its Side For A Better Viewing Experience! First of all, Thanks for visiting! If you have a condition that you are not sure would benefit from Chiropractic treatment, please contact us! 99 out of 100 people benefit from our treatment and we would love to help you! You can always request a call back and ask to speak to one of our chiropractors. 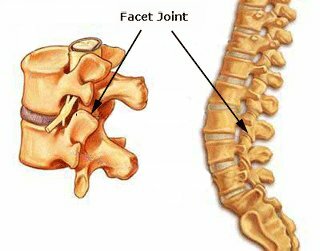 Facet joint syndrome also known as facet syndrome and facet joint sprain, is a common cause of back pain and is regularly treated in our chiropractic clinics. The facet joints, also termed zygapophyseal joints, are located at the back of the spine. There are two joints at each level, one on either side of the spine. The facet joints are classified as synovial joints and are enclosed within a joint capsule. There is synovial fluid within the capsule and the joint surfaces are covered with hyaline cartilage, the same type of cartilage that is covering, for example, the ankle joint. The role of the facet joints is to control excessive movement especially in rotation and extension, and therefore provide stability for the spine. Injuries to the facet joints can have many causes, but essentially it is a sprain and as such, it is caused by excessive movement causing damage to the joint capsule, which in turn cause swelling, inflammation and pain. The pain in turn causes a reactive muscle spasm, which is a protective mechanism. The result is a sudden severe pain and inability to move comfortably. The pain level often depends on the severity of the injury, similar to an ankle sprain. The pain from joint sprains is usually most severe for the first three days and then gradually subsides. When you sprain your ankle it is easy to rest and support it, but when it comes to the facet joints it is much more difficult to protect them from further injury. Quite often our patients say that they had had a ‘twinge’ in their backs before the onset of severe pain, which suggests that they injured an already injured joint. If the sprain is severe it can take several weeks to subside. The healing time for a damaged ligament or joint capsule is 2-6 weeks. Why do Facet Joint Injuries Occur? Essentially, the spine is a long chain of joints which are protected by ligaments and muscles and if some of the links stiffen up through injuries or anatomical changes it makes other links move more to compensate and eventually, the overuse of the flexible joints cause pain through sprain. Most injuries are caused by what is called recurrent micro-trauma, it means many small repetitive injuries, until the proverbial 'last straw'. That is why people often hurt themselves doing very trivial things such as bending to pick up a pen, and they hurt themselves before they even get to lift the pen. It does not have to involve heavy lifting, it is more often caused by awkward movements. Maybe things that you have done a hundred times before. There is another mechanism of injury that can cause facet joint pain called meniscoid entrapment. Research has shown that there is sometimes a fold present in the joint capsule that project inwards between the joint surfaces. This fold in the lower back-joints can get trapped. In those cases chiropractic teatment can sometimes have a seemingly miraculous effect with almost instant pain relief after one session of chiropractic spinal manipulation. Want To Know More? Request a Callback Here! Or Give Us a Call, To Find Out How We Can Help You. Typically, there is pain just to one side of the spine. The pain is usually felt to the side and lower than the actual site of the injury and the referred pain from the lower spine is sometimes felt in the buttock, groin or down the thigh. Referred pain from the facet joints in the neck is usually felt over the neck, shoulder and arm, and the referred pain from the mid back is usually felt along the ribs giving rise to rib pain. Even tough rest and inactivity helps to alleviate the pain, the back will generally feel stiff in the morning and after inactivity. Sometimes inactivity aggravates the muscle pain and therefore, it is best to alternate rest with moving and walking around. In rare cases there may be irritation of the nerve roots, giving neurological symptoms such as a feeling of numbness and pins and needles. If neurological symptoms are present it is termed lateral dynamic stenosis. Other possible causes for nerve entrapments include disc herniations. Go to chiropractic treatment and disc herniations. A chiropractor is usually able to make a diagnosis based on the history and the signs and symptoms of the condition. Sometimes, especially if the problem is long standing, if you have reached a certain age or if there is anything in your medical history to indicate it we may take an x-ray of the spine. You cannot diagnose a facet joint sprain on an x-ray, or CT or MRI-scan alone. The diagnosis is made on the clinical findings - but the x-ray may help to rule out other causes and in some cases help the chiropractor determine which type of treatment is most appropriate. If you suspect that you have sustained a facet joint sprain, rest and use an ice pack. The initial treatment involves avoiding the movements that cause the joints to be painful, but prolonged rest is not advisable. Make an appointment with your chiropractor as soon as possible to have the problem properly diagnosed. Once the diagnosis is made the appropriate treatment can be given. Chiropractic treatment would normally involve early manipulation to release the muscle spasm. The manipulation is not done the injured joint and the most appropriate treatment method will be chosen to avoid aggravating the problem, so don’t expect the treatment to be painful. The chiropractor will also give advice on how to get comfortable, how to move, and taught which exercises to do to get comfortable and help you to get on with your life as comfortably as possible. In our clinics we often hear from patients that they find painkillers ineffective. Some people advocate the use of non-steroidal anti-inflammatory (NSAIDs) drugs, which is an option if your pain is severe but you need to be aware of the possible side-effects. In an acute (short term) injury normally the pain subsides within 4-6 treatments. Once the pain has subsided core muscle exercises will gradually be introduced to create better spinal control and stability, which is one way of preventing the injury from coming back. You will also be giving postural and ergonomic advice to help you reducing the risk of injury. In a more chronic (long standing) type of facet joint problem, the management is more involved. Often degenerative changes may be present in the joints and discs. Degeneration of the discs will lead to reduction of the height of the disc, which in turn increase the weight bearing demand on the facet joints and that makes the joint more vulnerable to injury. The main difference in the treatment is that the period and number of sessions may have to be extended. Also, doing exercise long term will be extremely important to create more support and stability for the spine. In some cases ‘curing’ the problem might not be possible, but the goal of the treatment will be to make sure the problem stays manageable, allowing you to do your normal daily activities. National guidelines for treatment of back pain have advised against long term use of non-steroidal anti-inflammatory (NSAIDs) drugs, facet joint injections, nerve denervations and surgery. Why Does The Facet Joint Pain Recur? If you suffer recurrent episodes of facet joint pain it is usually a sign of what chiropractors would refer to as a ‘functional instability'. When you get a joint or ligament sprain the healing create scar tissue as part of the normal healing process. Scar tissue is less elastic and breaks more easily. It has also been shown that injuries leave the deeper spinal muscles weakened, permanently, even after the pain has gone. The only way to make the muscle recover is to do specific core muscle exercises. What Can I Do To Stop My Facet Joint Pain Recurring? There are many different treatments available. Recent research shows that spinal manipulation of the type chiropractors do and in combination with exercises is the most effective treatment for both acute and chronic facet joint pain. Chiropractors advocate dealing with the underlying neurological, mechanical and muscular problems. Just relying on taking pain killers and rest does not deal with neither of these causes, so even if the pain goes away with rest it is bound to come back due to the remaining underlying weakness. For each new episode of pain you have you become more at risk to have another episode. Research show that after four episodes of pain you are more likely to suffer chronic and long-term pain. The general recommendation is to make sure you get the problem diagnosed properly, have a chiropractor evaluating your core stability, have treatment if necessary and do the right type of exercise to help your problem. See what our patients think of us! Sign Up For Health News, Special Event And Offers Here! Your e-mail address is totally secure and will not be shared with third parties. Isis Chiropractic Centres have Shockwave therapy which is a clinically proven and highly effective treatment for chronic soft tissue injuries and certain bone conditions. Full-time Chiropractor in our Northampton Clinic. We are looking for a full-time Chiropractor in our Northampton Clinic. Patient Satisfaction Levels For Isis Chiropractic Centres! 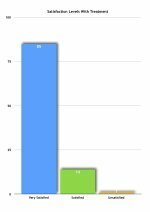 Self-reported results from the Patients at Isis Chiropractic Centres. These are the results from our treatment and what you can expect from Chiropractic care at our clinics. 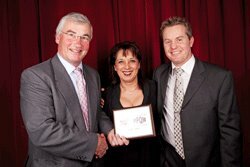 Isis Chiropractic Centres Given 6 Awards! The Queen Awards Chiropractic Royal Charter! Stop Injuries Play Golf Better And Hit The Ball Further? Find out more about our Golf performance assessment here! If You Can't Find What You Are Looking For, Click Here And Make An Enquiry! To Find Out More About Chiropractic Treatment, Watch Our Video! Bigger Screen? Click The Bottom Right-Hand Corner! Gardening and Preventing Back Pain. Watch Our Video! Just pop in you details in the form to the right and we will be in touch very soon. Or Just Give Us a Call, To Find Out How We Can Help You.